19.04.2017, Strasbourg – As part of his working visit to Strasbourg, Georgian First Deputy Foreign Minister David Zalkaliani held a meeting with Council of Europe Commissioner for Human Rights Nils Muižnieks. 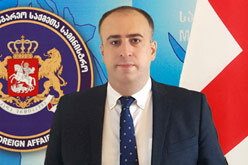 David Zalkaliani provided the Secretary General with detailed information regarding the latest development of Russia-Georgia conflict and the human rights situation in Georgia’s occupied regions. According to David Zalkaliani, Russia continues its destructive policy to which attests the Russian foreign minister’s recent “visit” to Abkhazia. Special attention was paid to the importance of access of the international monitoring bodies to the occupied territories of Georgia. The sides exchanged views over the reforms implemented by Georgia towards strengthening Georgia’s democratic development and protection of human rights.